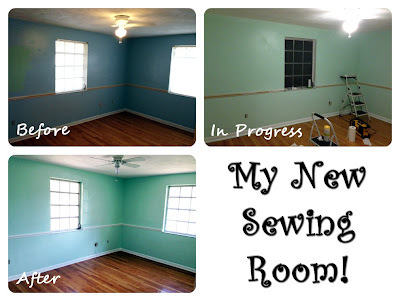 Show and Tell Meg: House Update: See My New Sewing Room! House Update: See My New Sewing Room! Isn't it cute?! The color is much more like the bottom photo - the sun in the background was messing with the colors on the camera. 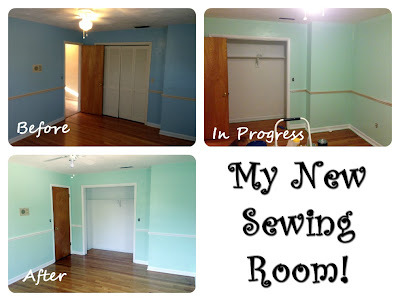 I seriously adore being in this room now :) Here is a recap of the progress shots. Pretty decent improvement from that drab blue color with all the mismatched trim colors. The new wall color is Icy Mint by Valspar and the moldings and closet are Ultra White by Valspar (I got all of them while they had a $5 mail in rebate - score!). And the closet! Seriously, why would you have a closet any color but white? It just looks so clean and fresh. These after photos were after I even went around the floor with a latex paint remover and scraped off all the spills from the previous owners. They were seriously the worst painters ever. That paint was everywhere. We even had to pain the ceiling and it looks so great. And isn't it crazy what a difference just painting that chair rail white makes? You wouldn't think it would matter that much, but the before vs after pics don't lie.